Dr. Elias Mallon, an ordained member of the Society of the Atonement, is a former Director of the Gray moor Ecumenical and Interreligious Institute in New York City. Currently, Dr. Mallon is the Interim Dean Director at Center for Multi-faith Education at Auburn Theological Seminary. He is well known for his deep interest in interfaith dialogue. A native New Yorker. Dr. Mallon also travels widely. He studied for several years in Germany, earned his Ph. D. in Near Eastern Languages from the Catholic University in Washington DC, and has also taught in Switzerland. He has also written many books and articles, including Neighbors Muslims in North America published by Friendship Press in 1989. At the outset, I would like to tell you how happy and how honored I am to be here at The Al-Khoei Charitable Foundation. When Dr. (Syed M.) Rizvi called me asking me to speak on Imam Husain, I was of course happy to do it. I have always had a great respect for the Shias, and your long and rich mystical and philosophical traditions. When Dr. Rizvi told me that I was to speak to you at the Islamic Center and told me where it was, I was doubly delighted. For one thing, I went to high school at Archbishop Molloy High School, which is very near here, just up on Mansing Street. But even more to the point, I have often driven by the Center and wanted to visit. As you know, I am a Christian and have spent many years studying Islam and engaging in Christian-Muslim dialogue. I am a Roman Catholic Christian and my church also has a long tradition of theology – Kalaam, of philosophy – falsafa, of mysticism – irfaan, and although we don’t have a word for it, we too do something very much like ijtihad. I must say that while there are many importance differences between Christianity and Islam, differences, which I believe, must be understood and treasured. 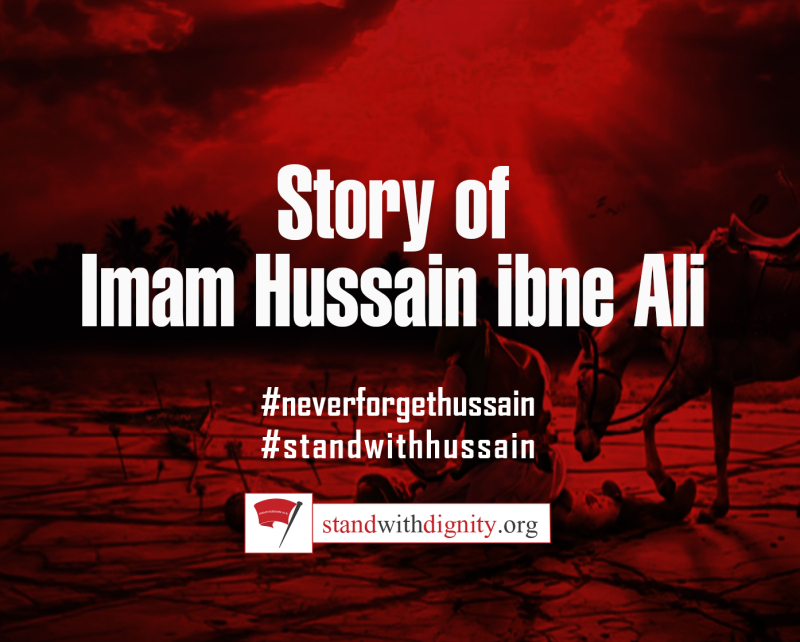 The story of Imam Husain ibne Ali ibne Abi Talib has special residence for us Christians. Both Christians and Muslims believe that God is powerful indeed omnipotent. The named Al Qadir and al Muktadir gives witness that in the Muslim tradition. Both Christians and Muslims take great consultation in the belief that our God is not only powerful but also good and just. The beautiful names, Al Aadil, the Just One, Al Lateef, the Gentle One, Al Karim, the Generous One, and even Al Wali, the friend, provided tremendous stores of riches for both Christians and Muslims to meditate upon. In fact, the justice, the power and the goodness of God are qualities upon which believers meditate and from which we draw strength in difficult times. One of the great mysteries which we as believer encounter is the suffering of the good and righteous persons. Among the Jews, the figure of Jo, a Jew. 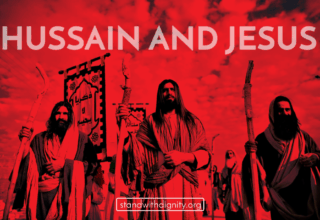 Among the Christians, the person of Jesus, and among the people of the Shia faith, Imam Husain, are pivotal figures in the eternal question not just of human suffering but the suffering of the good person. When the suffering of the good person as in the case of Jesus or Imam Husain suffer at the hands of evil people, the questions become even sharper. Imam Husain ibne Ali ibne Abi Talib was a beloved grandson of the Prophet. As you all know, better than I, together with his brother, Hasan, Imam Husain was declared Syed Shabab ahle Janaat (the Leader of Youth of Heaven). It is clear that he was a man of compassion and patience. Even after the death of his father Ali ibne Abi Talib, Imam Hasan was unwilling to risk the suffering and bloodshed of many people by challenging the Khalifah Muawiyah in Damascus. Imam Husain was not a rash person or one who was unaware of reality. He knew that challenging the ruling power would accomplish nothing and just cause the death and suffering of the people. However neither was Imam Husain a person of no principles. That became evident when he refused to do the Bay’a to recognize Yazid the son of Muawiyah, as the lawful Khalifah. Imam Husain had patience and wisdom but he was a man of principle who would only accommodate so much. You are far more familiar with the events which transpired after Imam Husain’s refusal to recognize Yazid as the legal Khalifah, and leading up to the tragic events which took place on the 10th of Muharram, 61 year of the Hijrah, October 10, 680 AD in the Georgian calendar. You know the weakness and the ultimate treachery of the Kufans. The historians, al Tabari, recount the events of Karbala in details. How the army under Ubaidullah ibne Ziyad and Omar Ibn Saad made seize to Imam Husain’s camp and tortured them with terrible thirst. Attack after attack reduced the number of the followers of Imam Husain. Although al Tabari states that the Imam had told his followers that they were free to escape, most of them chose to stay, and to stay with him. In the afternoon of the 10th of Muharram, the battle got brutal. 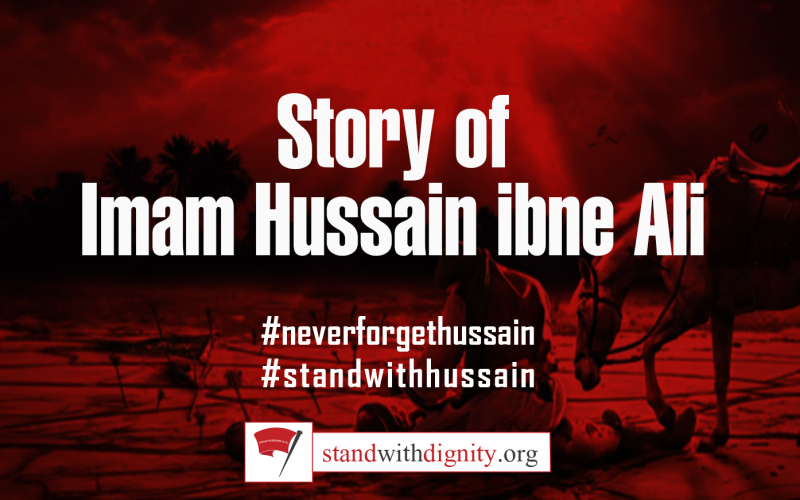 Imam Husain witnessed the death of his son Ali al-Akbar, the death of his nephew, Qasim ibne Hasan ibne Ali, and a young man who had come to the rescue of his uncle. Even al-Abbas, Husain’s half-brother, was not to survive the battle. In a way, the outcome could hardly have been otherwise, given the fact that the party of the Imam consisted of 72 men against armies of over several thousands. As you know, the end of the Imam was especially cruel. While holding his son Ali Asghar, in his hands, Husain pleaded for water for the child, and the child was killed by an arrow in the arms of the father. Imam Husain was severely wounded. And finally, and there some difference here, Shimar bin Dhil Jawshan or Ali Sinan bin Anas b. Amr, struck the blow which ended the life of the grandson of the Prophet. The women were taken as captives and although Ubaidullah wanted to kill Ali, the surviving son of Imam Husain, the boy was spared by the brave intervention of his aunt, Zainab who was mentioned today earlier. 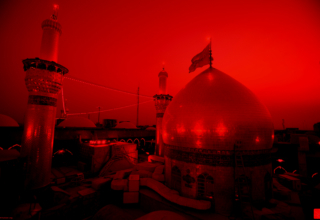 The martyrdom of Imam Husain was a crucial moment for the community of the Shias. Although it must have seemed that all was lost, the Community nonetheless was able and continues to be able to draw strength, much to other’s eyes seems like a total defeat. The sufferings of the Imam are looked upon by many as an offering for the benefit of the member of the Community A eulogy written- I don’t read Urdu. But a eulogy that was written in Urdu by the poet Anis, who lived between 1803 and 1875, illustrates that. 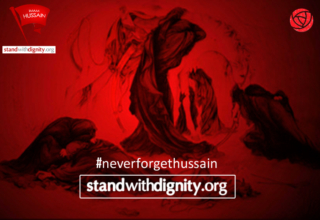 In the poem, the poet speaks for Husain at his dying moment. And the poem goes. The Imam is praying. And he is praying to God. The ‘You’ in the prayer is God. “I need not a house. The door of Your felicity is enough for me. I need not a head. My concern is only for You. Your grace is my pillow. I need not an arm. 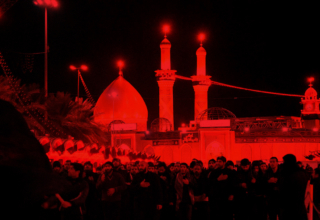 In the suffering and death of Imam Husain, Shia Muslims find a challenge and comfort. It is never easy to understand how the good person can suffer and especially die at hands of evil. The temptations are strong to ask God why? 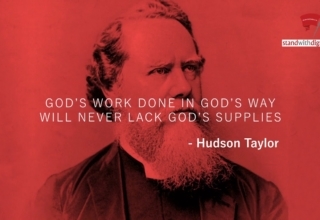 We recognize however that God is sovereign and infinitely wise. God is Al Hakim. We cannot always understand why things happen. Very often things happen which would not be the way we would do them. But of course we are not God. It is precisely when we are faced with the mystery of how God’s goodness and justice can allow the good person to suffer and die at that notion of obedience, submission, Islam with a capital or small ‘I’ if you want, is the most important. “Did I have the strength to endure having my entire household plundered? Or bring forth Asghar in my arms when Akbar was murdered? “Enough, enough oh Shabir for your God is embarrassed. Why are you afraid, Oh Shabir to enter my presence? Oh Shabir, I desire the gift you bring. Oh Shabir, I like humility among my servants. You have considered our court the gift of forgiveness. By understanding your status, one understands the Almighty. As a Christian, it is very easy for me to understand the feelings with the people of the Shia hold for Imam Husain. We Christians hold very similar feelings about Jesus. As people of the Book, we both believe that human life does not end with physical death. While that does not make the death of the good and righteous person, any easier to understand, such a death is nonetheless, a powerful witness to us. It is a witness that a person was willing to make the ultimate act of submission to God’s will, and was able to put everything, even life itself, on the line, based on the belief that this life is not all there is. On the belief that victory of evil is to loose. On the belief that power, goodness and the grace of God, are infinitely more powerful than the strength of armies, the power of governments and even powerful than death itself. In a very real sense, the defeat of Imam Husain is his crowning achievement. Al Husain ibne Ali ibne Abi Talib, grandson of the Prophet, been a sense of tremendous strength for millions of the Shia over centuries and throughout the world. The dynasty of Yazid and the household of Umayyad, was to survive Imam Husain by only 70 years. In the Gregorian calendar, Imam Husain died in the year 680 AD, and the Umayyad Dynasty was overthrown in the year 750. And replaced by another dynasty whose defeat was ultimately to be. Both dynasties and their leaders, including if not especially Yazid, are not part of a history long past. Victorious over Imam Husain in the short run, Yazid for the most part is unknown to most people on this planet. However the martyred Imam Husain, defeated in the short run, is ultimately victorious as the living symbol of a vibrant, spiritual Community which sees in Imam Husain, a perfect example of that which all she wishes to be in Muslims, that is totally submissive to God’s will.